WASHINGTON, D.C. -- The hiring climate at the start of 2015 is similar to where it stood in the second half of 2014, with Gallup's U.S. Job Creation Index coming in at +28 for the month of January. This is nearly identical to the +27 found in December, and just below the seven-year high of +30 reached in September. The index has experienced six years of incremental progress after bottoming out at -5 in February and April 2009. This includes sharp improvements in the first half of 2014, with the index increasing from +19 in January to +27 in May and June. Since then, progress has stalled, with the index staying within a narrow four-point range. 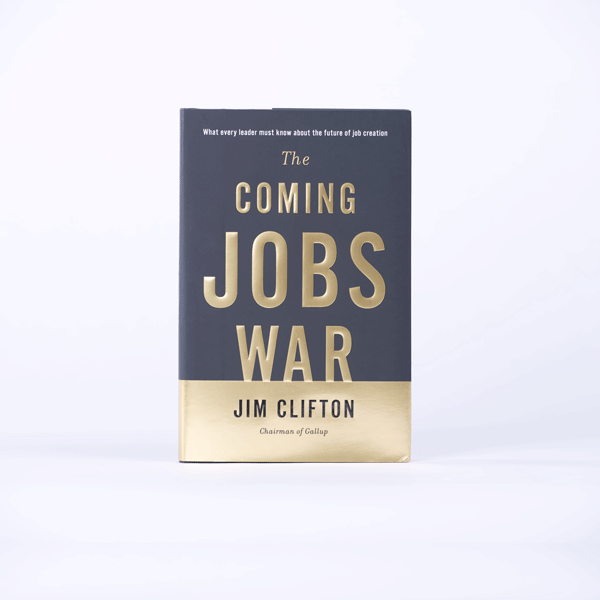 Gallup's Job Creation Index is a measure of net hiring activity in the U.S., with the January average based on a nationally representative sample of more than 16,000 full- and part-time workers. January's +28 score is the result of 40% of employees saying their employer is hiring workers and expanding the size of its workforce, and 12% saying their employer is letting workers go and reducing the size of its workforce. Forty-one percent reported no changes in staffing in their workplaces. Nongovernment employees (+29) continue to report greater levels of hiring than government workers (+19). 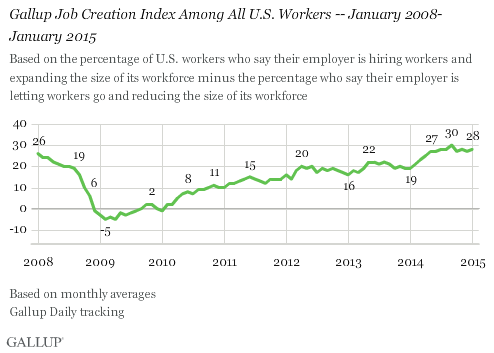 This has been the case in nearly all monthly readings since Gallup began tracking job creation in 2008. 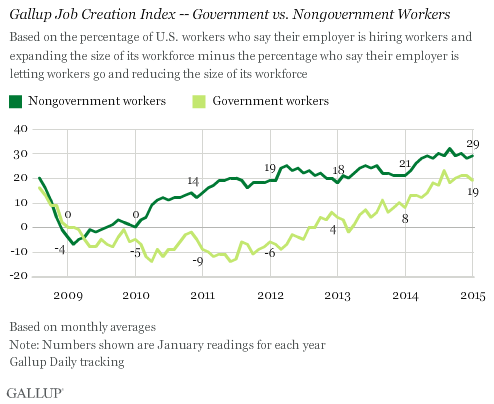 In January, 41% of nongovernment workers said their employers are hiring, while 12% said they are letting people go. Meanwhile, 36% of government workers reported staff increases and 17%, staff reductions. U.S. workers' perceptions of hiring at their places of employment are the most positive Gallup has recorded in any January since Gallup began tracking this in 2008. But the increase since last January came mostly in the first half of 2014. The index has since stalled, suggesting that the future of the jobs situation in the U.S. remains uncertain. At the same time, at least two other indicators show growing economic optimism: Americans' confidence in the U.S. economy has improved significantly since early December, and over the same period, Americans have become much more optimistic when asked if it is a good time to find a quality job. Whether these sentiments prove to be advance indicators of hiring that is more visible across U.S. workplaces may partly depend on whether they help fuel more consumer spending. Results for this Gallup poll are based on telephone interviews conducted Jan. 2-31, 2015, on the Gallup U.S. Daily survey, with a random sample of 16,501 employed adults, aged 18 and older, living in all 50 U.S. states and the District of Columbia. For results based on the total sample of national adults, the margin of sampling error is ±1 percentage point at the 95% confidence level. All reported margins of sampling error include computed design effects for weighting.